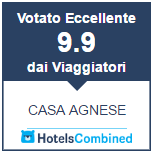 We’re Alberto and Daniela and we represent heart and soul of Casa Agnese. Our B&B is a real house and our three wonderful rooms are the perfect expression of our philosophy of humble greeting and hospitality. We’re located in the very center of Alba, as you step outside you’ll be immediately captured by our city’s daylife, in the most representatives places of the “town of a hundred towers”. A beautiful vacation with the unique touch of Casa Agnese and the historical heritage of Alba. Casa Agnese is located in a very convenient place, quiet for relaxing but still just one step from Via Vittorio Emanuele. You’ll be able to discover the lovely atmosphere of our medieval town and see beautiful monuments, towers and buildings perfectly treasured. The streets running alongside Casa Agnese are the best place to do shopping with plenty of boutiques, local products’ shops, libraries and restaurants. The interior design is modern and elegant, our house is sophisticated, the details well-finished. Our rooms are spacious, comfortable, warmly painted and cozy. Each one has been carefully designed to offer you the best. Booking through our website a minimum stay of 3 nights, you will get a free tasting of your choice, at one of these three wineries in the Barolo area. Via Vittorio Emanuele, historically the main road in Alba, also called “Via Maestra”. Has its origin in Piazza Risorgimento and goes through the whole city center. It’s the best place for long and relaxing walks, for seeing the beautiful expression of our architecture through the ages, from medieval to liberty. At Via Maestra n°11 is located Casa Fontana, known for his decoration dated back to the renaissance which goes through the first and second floor of the façade: you’ll see majestic knights and mistress, minisrtels, beautiful flower ornaments. Still worth of mention are the Palazzo Serralunga and the Palazzo dei Conti Belli, located at the n°18. San Lorenzo’s Cathedral, located in Piazza Risorgimento. Built at the end of the 5th century above the remains of a previous building dated back to the 12th century. In 1486 a second reconstruction was ordered by the bishop Andrea Novelli. The most important reconstruction dates back to the 1652, when the whole cathedral was restored to recover damage caused by some earthquakes. Between 1868 and 1872 were made additional reconditions, of the roofs and the vaults, the apse, the façade, the lateral windows and the paving. San Domenico’s Church. Great reconstructions started in the 70’s thanks to the “Famija Albèisa”, which made it possible now for the building to show its original splendor. Now deconsecrated, the church hosts exhibits and concerts. Next to San Domenico is located Santa Caterina’s Church, built in the 18th century. San Giovanni’s Church, located in Piazza Elvio Pertinace. Probably built in the 16th century, was then recovered in 1894. There are several well known and precious paintings inside, like the Madonna delle Grazie of Barnaba da Modena (1377), the Adorazione del Bambino of Macrino d’Alba (1508), the Madonna del Carmine of Guglielmo Caccia, also called Moncalvo (1568-1625). In the same square are located two of the most interesting tower-houses of the 15th century. The towers. They are the main attraction of the city center, built between the 14th and the 15th century by the noblest families of the town. The legend says that one Alba had the incredible amount of a hundred. There are now only 20 remaining, some of them lowered or joined with newer buildings. Three of them are clearly visible from Piazza Del Duomo, the highest and most important: Torre Sineo, Torre Paruzza, Torre Astesiano. Civic, Archeologic and of Natural Science museum Federico Eusebio. Built in 1897, has three permanent sections of prehistoric archeology, romanic archeology and natural science (paleontology, geology, zoology and botany), plus an archeological city tour with 28 stations both above and underground, and special naturalistic paths alongside the river Tanaro and through our hills of Langhe and Roero, not to mention the several temporary exhibits. Here in Alba there’s plenty of earth precious gifts. The majestic king of which is the white truffle, a long know treasure of our land. Our best recipes include: vitello tonnato, insalata di carne cruda, fonduta, tajarin al sugo di carne, agnolotti al plin, brasato al Barolo, bagna caôda, bonet al cioccolato, panna cotta. The unique taste of these dishes is enriched by the excellent wines of our hills. The Nebbiolo d’Alba grapevines gives us the Barbaresco, Barolo and Roero; The Dolcetto gives us four wines, Dolcetto d’Alba, Dolcetto di Diano, Dolcetto di Dogliani and Dolcetto delle Langhe Monregalesi; The Barbera, the Arneis, the Roero Arneis, the Moscato, the Moscato d’Asti, the Asti Spumante. All of our superior wines are exported worldwide.